With the possible discovery of the Higgs boson, there has been much speculation in the media about the consequences of the discovery. Some have even suggested that it implies that time travel may be possible. 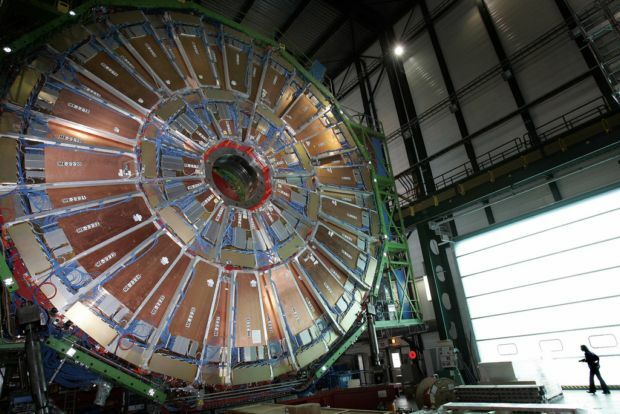 While scientifically there is currently no experimental evidence that time travel as such is physically possible, and indeed it is not even certain at the time of writing that the particle discovered in CERN is indeed the Higgs boson, quantum mechanics does predict experimentally verifiable effects, where past measurement outcomes seem to have been affected by future choices. We are taught to believe that the future is changeable while the past is engraved in stone. Causality, according to this view, can propagate in only one direction, past events can influence future events while future events are still undetermined and cannot influence what already happened. While one has grown accustomed to hearing of the non-intuitive findings of quantum mechanics, this one may be strangest of them all: choices made in the future appear to influence measurement results in the past. In everyday life, we think of measurement as for instance taking a ruler, placing it next to an object and reading off its length. We do not expect the length of the object to be altered as a result of our measurement. However, quantum mechanically, this is not so. Quantum objects are so tiny that measurements such as the one described above are out of the question. Instead, measurements are conducted through a proxy physical that is influenced by the property we want to measure. The change in this object, in turn, changes the pointer on the measurement apparatus that we can read off. A consequence of this interaction is that the measured object has changed as a result of us measuring it. The extent to which a measurement changes the object depends on the strength of the influence between the proxy and the measured object. This also determines the amount of information one can extract about the property being measured. To get around this problem, physicists have developed so called weak measurements, which influence the measured object by such a slight amount that the change is negligible. While they give very little information about the object itself, this changes if one has multiple copies of the same object. Then one can conduct each measurement on a new copy of the object and acquire a large amount of information with a minimal disturbance to the object. Now suppose that at around noon time, Alice conducts several weak measurements of a few different properties on many copies of the object. The fact that these measurements are weak means that their effect on the quantum state is negligible and thus cannot influence future measurement outcomes. In the evening, Bob comes along and chooses a measurement type out of a number of options. Now if Bob goes to Alice and reveals his measurement results to her, but not his choice of the measurement type, she can use her own data to deduce what type of measurements he must have performed. In other words, the choice of measurement in the evening is partly reflected in Alice’s data collected at noon! This may be the strangest quantum result yet. This leaves us with several options for interpreting the results. Could it be that Bob’s choice in the evening caused Alice’s outcomes at noon? Or perhaps that Alice’s outcomes at noon determined Bob’s measurement choices in the evening? It turns out there is a more conventional explanation. Neither Alice’s outcomes, nor Bob’s choices caused the other, they were simply correlated. You may wonder at this point whether this procedure can be used to send information into the past, or even to time travel. Unfortunately the answer to this question is also a negative – Alice required Bob’s measurement results to infer what choices he made in the future. This means that before those results are available she cannot know anything about Bob’s choices. However, the information about choices is not entirely contained in Bob’s measurements. She needs to have her own data as well. Whether we will ever be able to time travel or not, we know that our current understanding of physics is not sufficient to allow us to build a time travel device. Whether nature allows time travel or not, together with all the ensuing paradoxes, is on the other hand an age old question the answer to which will likely not be known with any certainty for some time to come.